a general term for floating ice which has been squeezed together and in places forced upwards; includes rafted ice, telescoped ice, hummocked ice and ridge ice. the character and amount of atmospheric pressure change for a three-hour or other specified period ending at the time of observation. lowering the melting point of ice by applying pressure. the meridian (line of longitude) defined to be 0 degrees and passing through the Royal Greenwich Observatory in London; also known as the International Meridian or Greenwich Meridian; the Prime Meridian and the opposite 180th meridian (at 180 degrees longitude) separate the Eastern and Western Hemispheres. 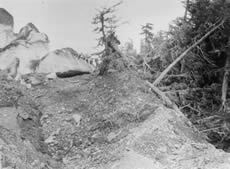 in geology, a mineral compound resulting from a process by which the primary mineral component is replaced by another, although the compound maintains constant appearance and dimensions. an instrument used for measuring the water vapor content of the atmosphere; a type of hygrometer; it consists of two thermometers, one of which (the dry bulb) is an ordinary glass thermometer, while the other (wet bulb) has its bulb covered with a jacket of clean muslin which is saturated with distilled water prior to an observation; when the bulbs are suitably ventilated, they indicate the thermodynamic wet- and dry-bulb temperatures of the atmosphere; one variety is the assman psychrometer (a special form of aspiration psychrometer for which the ventilation is provided by a suction fan). tables prepared from psychrometric data and used to obtain vapor pressure, relative humidity, and dew point from wet- and dry-bulb temperatures. 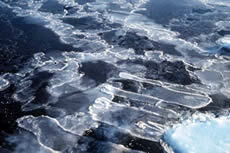 an accumulation of melt water on an ice surface, mainly due to melting snow, but in later stages also to the melting of ice; the initial stage consists of patches of slush.